Keep your mouth shut and wave the flag. Period. 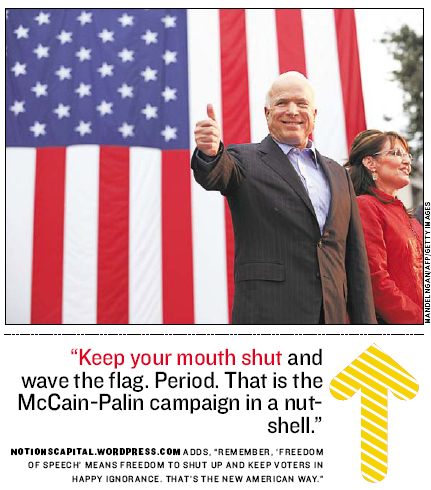 That is the McCain-Palin campaign in a nutshell. That’s what it looks like to me, and I’m barely even paying attention. I admit that most of the blogs I read are fairly queer and liberal, so it’s no shock that the Republicans often draw the short straw in their eyes, but this time around it’s really something else! I’m sort of used to the Democrats running a good race, but along the way doing whatever they can to come up second. This campaign though, it looks like the Republicans stole an old playbook of the Dems and are really trying to tank it… and they don’t even seem to notice. Even if the debate does happen tonight, I’d like to think that I have better things to do on a Friday night. I don’t, of course, but I’d like to think that I do! In the era of DVR and YouTube, I doubt they’re going to suffer at all from airing it on a relatively dead night for television. Also just wondering: if people aren’t dropping everything to run out and buy the cars, cologne, hair & skin care products, appliances, couture, booze, underwear, fitness equipment, cell phones, jewelry, etc. that celebrities endorse… why does the media get all up in arms when a celebrity goes on record with their political endorsement? Does (should) anyone really care who a singer, actor, or talk show host is voting for? That’s more of a news complaint than a political one, but until weather, gas and money were concerns, politics was all the media had to report about! Next story News from the Future! Previous story video: Good ol’ days? As part of my job I scan the news off and on all day long, and I can tell you I am so tired of this political year I could scream. Especially since statisticians have decided that 90% of the population have already made up their minds and will not change them before election day. That means that all this blather is aimed at 10% of the population. @kyle: 90% of the population had made up their minds about which party to vote for before the candidates for the primary elections were announced. Like me, most of the country leans so heavily one way or the other that they will vote for their party regardless of the candidate. All the blather from the candidates in every presidential election season is aimed at just 10% of the voters. Being a football fan, I kind of relate the whole thing as being analogous to a sporting event. I’m not watching all the hoopla to see who is the better team, I’m watching to cheer on my side and to get excited when they score a few (political) points. Election night will be bigger than a Super Bowl party at my house. very thoughtful and entertaining entry. Kyle, take notes. Please. are there people out there who will vote for a candidate based solely on the celebrities who endorse them? sadly, the answer is probably yes. rather than decide for themselves who is best fit to run the nation, they wait for their favorite celebrities to endorse a candidate. then, like lemmings, they follow the celebrity to the candidate at the polls.